I regretfully announce the passing of Donald Sinclair Davis, the American character actor known for his roles on Stargate SG-1 and Twin Peaks. He had a massive heart attack on Sunday morning and died. He was 65. 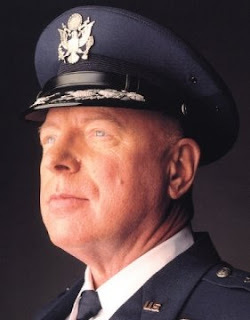 Davis was best known for his portrayal of military characters, among them Major Garland Briggs in David Lynch's surreal series Twin Peaks, General Harlan Ford in Atomic Train, guest appearances as Captain William "Bill" Scully on The X-Files, an Army General on an episode of The Outer Limits, and provided the voice of G.I.Joe's helicopter pilot Wild Bill in the Valor vs. Venom series, but he'll no doubt be most remembered as the officer in command of the SGC during the first seven seasons of Stargate SG-1, Major General George Hammond. Davis' ability to portray military officers and authority figures is no doubt due in no small part to his real-life experience as a Captain in the US Army who served in Korea before turning to acting. He was also an accomplished painter and woodcarver and his work can be seen on his official website. One of his final filmed appearance will be as Lt Gen Hammond in the forthcoming Stargate: Continuum, the next Stargate DVD movie available in August. Although another website has him as a Major General , creedon surely you are not wrong?!?!?!!? @ Civvy and Anon. : My sentiments exactly. @ Vaughan: Sigh! Hammond was, as commander of the SGC, a Major General for the first 7 seasons of SG-1. Just before Seson 8, he was promoted to Lieutenant General and became commander of the Department of Homeworld Security. We gather from a later appearence and an episode in season 10 that Hammond was retired as of the beginning of season 9 as Major General Jack O'Neill was promoted into that position. He does appear as a Lt Gen in Stargate: Continuum, but we can assume it's a time travel senario. Vaughiny, the Lt.Col has been wrong on several occasions before but no witnesses have ever lived to tale the tale. Take a Hint, it's not wise to point out the errors of a right wing gun nut.